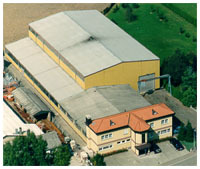 The company „Hans Klein Dreherei – Vorrichtungsbau - Formenbau“ is founded by Hans Klein in his parents house, on an area of 70 sqm. Laying of the foundation stone at new company location. On a plot of 6.000 sqm., Hans Klein is constructing a manufacturing hall including an office building, area is 500 sqm. In addition to production, he starts trade in used machine tools. Hans Klein is giving more importance to trade and finishes the production. The sole proprietorship is converted to company “GmbH"
For expansion of stock capacity, Hans Klein constructs a new warehouse. Its surface is 1.600 sqm., capacity of crane is 20 tons. It is followed by an enlargement of the office building. In order to come up with ever increasing need for more space, Hans Klein rents an external warehouse in Ottersweier, 10 km distance to company’s site. Having additional 2.500 sqm at disposal, another machines can be displayed. A 35 tons crane is available. Hans Klein buys a pot of land of 3500 sqm at the company site. A new warehouse with a surface of 1700 m² is built and a crane of 50 tons’ capacity is installed. The rented hall is cleared.